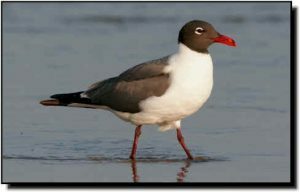 Comments: Primarily found along the Atlantic and Gulf coasts, Laughing Gulls in breeding plumage resemble this region’s more common Franklin Gulls. In flight, breeding Laughing Gulls show more dark on their primaries, whereas the Franklin’s Gulls’ wingtips show a white bar and black and white wing tips. Laughing Gulls are slightly larger, less stocky and have a heavier, more drooped bill than Franklin’s Gulls. Laughing Gulls occur in small numbers or are found only in localized sites within the Great Plains.